The Celtic Insular style is most famous for its highly dense, intricate and imaginative decoration, which takes elements from several earlier styles. From late Celtic art, sometimes known as the “Ultimate La Tène” style, come the love of spirals, triskeles, circles and other geometric motifs. These were combined with animal forms probably mainly deriving from the Germanic version of the general Eurasian animal style, though also from Celtic art, where heads terminating scrolls were common. Interlace was used by both these traditions, as well as Roman art (for example in floor mosaics) and other possible influences such as Coptic art, and its use was taken to new levels in Insular art, where it was combined with the other elements already mentioned. There is no attempt to represent depth in manuscript painting, with all the emphasis on a brilliantly patterned surface. In early works the human figure was shown in the same geometric fashion as animal figures, but reflections of a classical figure style spread as the period went on, probably mostly from the southern Anglo-Saxon regions, though northern areas also had direct contacts with the Continent. The origins of the overall format of the carpet page have often been related to Roman floor mosaics,Coptic carpets and manuscript paintings, without general agreement being reached among scholars. C. R. Dodwell, on the other hand, says that in Ireland “the Insular style continued almost unchallenged until the Anglo-Norman invasion of 1170; indeed examples of it occur even as late as the thirteenth and fourteenth centuries”. 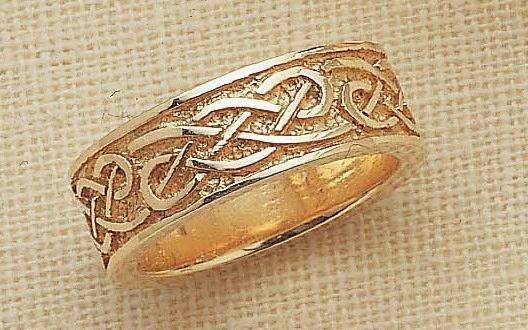 Celtic moti fs most commonly recognized are the knotworks, key patte rns, and spirals found in the illuminated manuscripts of the Early Medieval Period. The most famous manuscript is the Book of Kells. Some others are the Lindisfarne Gospels, the Book of Durrow, and the Durham Gospels. Before the period of the manuscripts the Celts carved symbol stones and created a wide variety of jewelry for themselves and their horses. Since the Irish Celts held back the Roman armies from conquering them, they kept alive the Celtic Arts. There have been several revival periods. In the United States one of those revivals happen around the Revolutionary War. Geometric motifs have always been prominent in Celtic artwork. 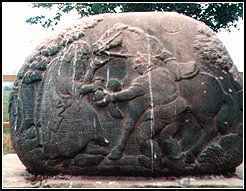 Some of the motifs or symbols date back to 3000 BC and can still be seen today on stone carvings. Newgrange in Ireland, is one of the oldest burial mounds in Europe and is highly decorated with stone (see picture on the right) carvings depicting spirals, lozenges, chevrons and key patterns. Single Spiral The single spiral is the oldest and most recorded of these motifs. It has symbolized the concept of growth, expansion, and cosmic energy, depending on the culture in which it is used. To the ancient inhabitants of Ireland, the spiral was used to represent their sun. Sun Spirals A loosely wound anti-clockwise spiral represented the large summer sun. A tightly wound, clockwise spiral represented their shrinking winter sun. Double Centered Spiral The dual centered spiral is also prolific in stone carvings. It has associations with motifs from other cultures such as the Yin Yang symbol. It signifies the duality of nature and balance. Trip le Centered Spiral Triple centered spirals were used by the early Christian monks in their illuminated manuscripts. The motif depicts a trinity of spirals emanating from a single source and may well have been used by the monks to represent the Christian holy Trinity. 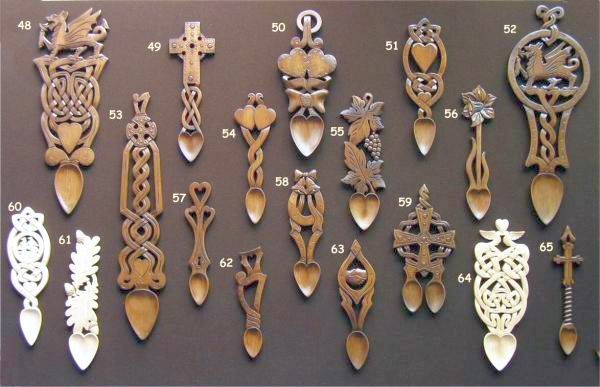 Since Celtic Art is alive it will continue to evolve yet it will retain the influence of the ancient world such as the manuscripts, the Scottish symbol stones, and the spiraled carved stones found in dolmens. Alderley Edge has been a sacred site for many thousands of years and has many legends attached to it. King Arthur and his men are said to sleep somewhere beneath the sandstone cliffs. A local story tells of a farmer who was on his way to Macclesfield Market to sell a fine white mare. Along the way he met a Wizard who offered to buy the mare for a good price. The farmer refused hoping that he could get a better price for such a fine animal at the market. Once at the bustling market it seemed as though he had been bewitched, not a single offer was made for his mare although lesser animals where sold quickly for good prices. Dejected the farmer returned home and came across the same wizard who again offered to buy the horse. The farmer agreed and the wizard led him through a woodland to a steep sandstone cliff face. The wizard touched the rock with his staff and the rock parted with a thunderous sound to reveal a huge cavern. Inside the cavern rows and rows of warriors lay in deathly sleep. Every warrior bar one had a horse standing next to him. The wizard proffered the farmer a bag of golden coins for his horse and the farmer fled out of the cavern through the wood and home. He never saw the cavern or the wizard again. For a more in depth account of the tale please consider the article, The Wizard of Alderley Edge. for the water falls by the wizards will. The date of the carving and the text are unknown but the spring has been known as a wishing well for many years. Bradsey Island is also known as the island of the currents and the saints. There are said to be the graves of 20,000 saints interred on the island, and legend suggests that anybody buried here will not go to hell no matter how wicked his deeds. As well as being the burial place for monks and saints, it is said to be the final resting place of Merlin, who sleeps in a cave guarding the treasures of Britain, waiting for a time when he is needed again. 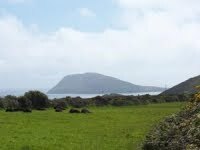 The island was colonized by St Cadfan in 516, and was the home to an Augustinian Abbey. A place of pilgrimage for many years three trips here was said to equal one trip to Rome. The actual trip over to Bardsey Island was very treacherous due to the unpredictable currents within Bardsey Sound; the pilgrimage must have been a hair-raising experience. The isle is said to be haunted by ghostly monks, sometimes seen on the shore at night. Their appearance is said to foretell misfortune in the area. St Mary’s Well on the Island has a curious tradition associated with it. If you went to the well, got a mouth full of water, walked back up the steep steps leading to the church, and then walked around the church three times still holding the water in your mouth you would be granted a wish. Ben Bulben (or Benbulben, Benbulbin, Binn Ghulbain) is a large glacial rock formation in the Darty Mountains. Ben Bulben is said to be the final resting place of Gráinne (daughter of Cormac mac Airt, High King of Ireland ) and Diarmuid. The folk tale The Pursuit of Diarmuid and Gráinne (17th century), details the elopement of Gráinne with Diarmuid Ua Duibhne who was one of the Fianna. Gráinne was however betrothed to the giant Fionn Mac Cumhaill (or Finn McCool), leader of the Fianna. 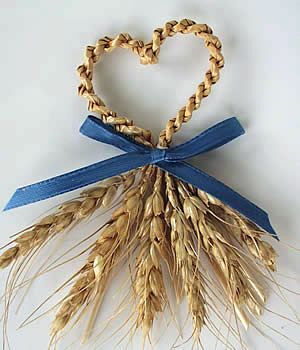 At the betrothal feast Gráinne first saw Finn and was horrified to see he was older than her father. When Gráinne saw Diarmuid she became enamoured by the young warrior and decided that being with him was a preferable to marrying Fionn. Unfortunately the wedding plans had developed too far, with tributes having been paid and agreements made. Gráinne relised that breaking that calling the wedding off now would lead to blood shed between the High King and Fionn, but she could not bring herself to marry him. She put the wedding guests asleep with a potion then asked Diarmuid to leave with her. But Diarmuid was a loyal Fianna warrior and refused to betray Fionn his leader. Left with no other choice she places a geis on Diarmuid, forcing him to elope with her. The couple fled for their lives and were chased over all across Ireland, always hiding and evading Fionn. Along the journey they received aid from Aengus Og, the foster father of Diarmuid who hid Gráinne under a cloak of invisibility on one of the occasions when Fionn got close. The leader of the Fianna eventually gave up his chase and seemingly putting vengence aside he let Diarmuid and Gráinne settle down with each other. Years passed and Fionn invited Diarmuid to a boar hunt at Ben Bulbin. A phrophesy had informed Diarmuid that he would one day be killed by a boar, but desite the evident danger he attended the hunt and was fatally wounded when an enchanted boar gored him. Diarmuid had one chance to live, that required Fionn to magically heal him by letting the wounded man drink water from the giants cupped hands. Fionn refused to help. The Fianna begged Fionn to save Diarmuid and still he refused. It was only when Fionn’s grandson Oscar threaten to fight the Fianna leader, that he relenquished and tried to save Diarmuid, though it was too late and the young warrior died. Ben Bulben is also associated with St Columba. 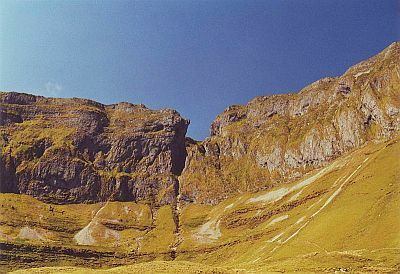 In 561 an argument he was having with St Finnian over the rights to a copied psalter (A volume of the Book of Psalms) led to armed conflict, the Battle of Cúl Dreimhne, when Columba took between 2000 and 3000 troops to Ben Bulben. County Sligo is sometimes referred to as Yeats Country after the poet and member of the Golden Dawn, William Butler Yeats (born13 June 1865– died 28 January 1939). In his ‘Writings On Irish Folklore, Legend and Myth’ he alludes to the fairies that live on the slopes of Ben Bulben. He also wrote the poem ‘Under Ben Bulben’. 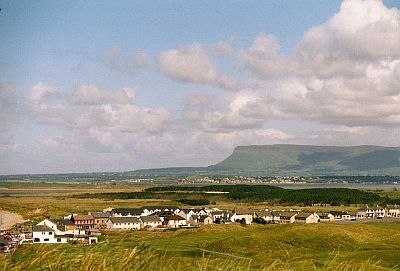 County Sligo is considered integral to the poet’s work. “A little north of the town of Sligo, on the southern side of Ben Bulben, some hundreds of feet above the plain, is a small white square in the limestone. No mortal has ever touched it with his hand; no sheep or goat has ever browsed grass beside it. There is no more inaccessible place upon the earth, and to an anxious consideration few more encircled by terror. It is the door of Faeryland. In the middle of night it swings open, and the unearthly troop rushes out.” WB Yeats, Mythologies. 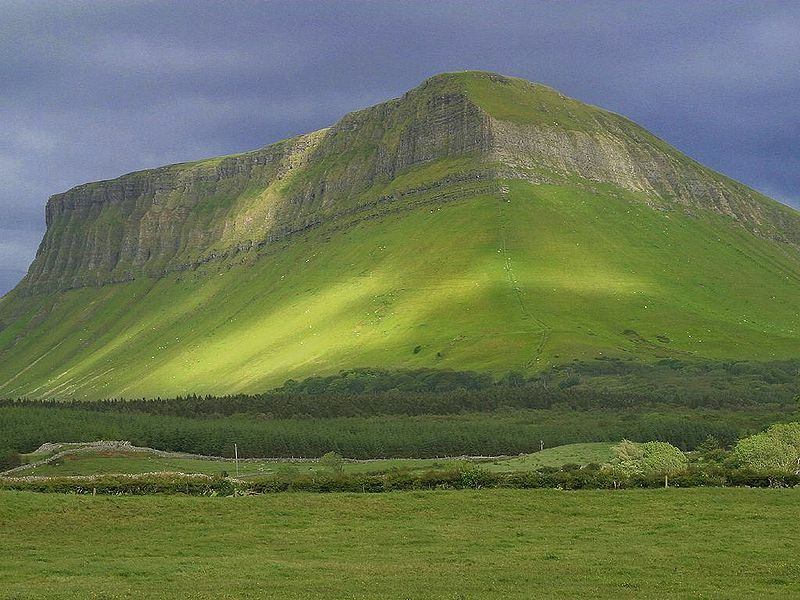 Yeats’s famous poem, “Under Ben Bulben” , is basically a description of Yeats Country. It describes the sights that he saw in Yeats Country. As posted by Jeremy Taylor from his book “Seven Wonders” . All rights reserved by the author. History, the ritual landscape and geometry once resonated very much as one. Faint traces of our ancestors whose silent whispers in the landscape once conveyed so much awe and splendour now sadly lie silent, their purpose and meaning largely forgotten, for in general there is a present day lack of any real sense of connectedness. This compounds our ability to relate – be it to the environment – through the seasons, the cosmos – through the heavenly bodies or to our community through a neighbour. For far away from the mind boggling complexity of the pyramids of Giza, yet equally compelling, sit seven sites of mythic antiquity whose geomantic and geometric design collectively creates a beautiful and vast heptagon in the landscape. ‘Mathematical geomancy….does not mean the imposition of abstract designs upon the landscape, but the detection and enhancement of the geometry that is already concealed within it’ (Behrend, 1975 ). Over a decade later I learned that the landscape symbol I discovered had been employed by our forefathers before whilst plotting their temples and markers in the landscape of Southern Britain ( Behrend, 1975 ), consciously created and designed to personify a harmonious fusion between temple proportion, the Earth’s circumference and ancient units of measure. In the early 1900’s Sir Norman Lockyer studied ancient alignments and the astronomical significance at Stonehenge. As well as traditional straight line alignments across the landscape Lockyer discovered an equilateral triangle whose three points ( Stonehenge , Grovely Castle hill fort and Old Sarum hill fort ) were all exactly 9.656 kilometres from each other. In more recent times David Furlong ( Keys to the Temple, 1997) a phenomenal circle of megalithic and largely Christianised pagan sites, also with this same 9.6 km factor. Only this time it was the radius of the circle. The symbol I have discovered in Suffolk, centring on Bury St Edmunds is identical in size to these proportions; at 19,149 metres across (nearly 12 miles) it is only 4 metres out from the size of the twin circles of ancient sites on the Marlborough Downs. The landscape heptagon includes ancient Neolithic earthworks, a long barrow, standing stones and the only location in East Anglia, I believe, where all the three ancient track ways (the Icknield Way – the oldest road in Britain , Peddars Way and the Puddingstone Track, whose origins date as far back as 6,500 B.C. ) coalesce. 1 – Scientific American reported that a 75 metre wide circle near Goseck in Germany is the remains of the world’s oldest observatory, dating back 7,000 years and is the first circle whose function is evident ( Mukerjee, 2003 ). 2 – Evidence in France at Lascaux also shows that our ancestors as long ago as 14,00 – 27,000 BC had already developed a sophisticated preoccupation with the phases and movements of the moon at this time. The earliest written astronomical records possessed a preoccupation with the risings and settings of objects against the horizon, measuring the duration’s of time between these and other such ‘heavenly’ acts. This preoccupation with celestial events is believed to be connect with the cycles of vitality and fertility of the Great Mother Goddess through the stellar and solar events, which in turn affected her ( Broadhurst & Miller, 1989 ). We know our ancestors were capable of transporting and erecting approximately 10,000 megaliths, some up to 30 tons in weight at the same time as the 5th dynasty Egyptian pharaohs who were erecting their own seven major pyramids. 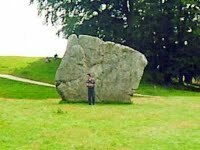 At Avebury in Wiltshire the same volume in chalk as that of those seven major pyramids was being excavated – around 90,000 cubic metres ! ( Burl, 1979, Furlong, 1997 ). These ‘Stoneage’ ancestors were also capable of maintaining a standard unit of length : megalithic yard of 2.72 ft, from one end of England to the other, all with a margin of error of only 0.1 % ( Thom, 1967 ). It is no coincidence that they chose these numbers to represent their sacred canon for the ratio between the dimensions of the earth and the moon is 10 : 2.7272 – volumetric mean radius 0.2727 km . The ratio between these planets and their inherent geometrical proportions equals the megalithic yard of 2.72 feet and is very close to the 2.718…of energy constant e, e being the rate at which anything doubles, from plant growth to bank interest. These ancient monuments on the surface of the earth were not only erected to discover the patterns of behaviour of our celestial neighbours ( the major planets and stars ) but were also designed in such a way as to embody those patterns, already known in what has been described as a ‘religious architecture’ ( North, 1996 ). At least one thousand years before the earliest mathematicians of classical Greece SAM ( stone age man ) had a competent working knowledge of geometry and was capable of setting out elaborate stone circles in a variety of ellipse shapes based on at least three of the different Pythagorean triangles- 3,4,5, – 12, 35, 37 and 5, 12, 13 ( Thom, 1967 ) all with a proficiency only rivalled today by a trained surveyor. Temples such as Stonehenge were founded on this relationship i.e. the width of the lintel stones being exactly one Jewish Rod – 3.4757485 ft, a unit of measure equal to one six-millionth part of the Earth’s polar radius. The ancient science behind this embodiment of number was once inextricably bound up with a world view containing science, religion and magic, the mastery of which would have been central to the priesthood’s ability to perform and carry out the necessary geomantic skills needed for locating a particular sacred site. We now appreciate that individual ancient sites and collective structures carried profound psychological meaning to our prehistoric ancestors. Round barrows served to symbolically ‘represent the wider landscape in architectural form’ ( Watson, 2001 ) and were believed to represent the centre of the world, or even cosmos ( Richards, 1996 ). These great monuments were built to influence the way people experienced the landscape and how they were configured serving to structure the ways that people understood both space and time. Even mainstream archaeology is embracing ideas now which a decade ago would have seemed fringe and ‘new-age’ which appeared In the Journal of British Archaeology ( March, 2004 ). There it is acknowledged that the plan of the three henges at Thornborough in Yorkshire was designed to be an exact mirror of the three main setting stars in the belt of the constellation of Orion between 3,300 – 3,000 B.C. Our own internal rhythms interact with the Earth’s low frequency isoelectric field, the magnetic field and our own electrostatic field, affecting our balance, REM sleep patterns, health and mental focus. We live amongst a complex matrix of oscillating fields within which life has evolved over many epochs. Minute fluctuations in one interlocked field have cosmic ramifications upon others. Many times per second the pulses of these fields circumnavigate the globe between our planet’s surface and the ionosphere ‘sending co-ordinating signals to all organisms’. These signals connect us to the global electrostatic field, the Schuman’s resonance ( SR ) which has been described as the orchestrating pulse for life on our planet ( Miller & Miller, 2003 ) and have been known to ‘reactivate stalled healing processes, enhance growth, accelerate immune responses’ ( Sidorov, 2001 ). There is a consistent connection demonstrated between frequency, wavelength, energy transference and the arcane landscape. In a world of ‘dumbing down’ reality TV it is possible to reconnect, reconfigure with the infinity within ourselves. I see the heptagon in “Seven Wonders – Suffolk’s Ancient Sites : a Vision of an Arcane Landscape”, whose geometry is closely bound to the circumference of the Earth and to the wavelength of those frequencies which circumnavigate it as a vehicle for doing so and may your god(s) and goddesses guide you well on your way. Hi to all!… I was recently contacted by Kevin Spahr from SPAHR PRODUCTIONS and Spahr Studios who is currently finishing a documentary about the Spoutwood Fairie Festival. A serious documentary about fairies, lots of fairies, and a magical place called Spoutwood. “Well, I was born in Wales. I’m Welsh on my father’s side and Irish on my mother’s. I started classical voice training when I was 9 and when I was 12, one of my singing teachers taught me how to sing “My Lagan Love” with the Gaelic lilt. She… had a Scottish background. My voice suited that type of singing so I learnt other Celtic songs. 17 year old Siobhan was born in Wales with Welsh and Irish heritage. Classically trained, Siobhan turns her haunting soprano voice and delicate harp playing to a repertoire of traditional Celtic songs. At a young age she has already recorded three albums, won classical and folk awards and has played at many major festivals. She is a truly enchanting performer. Siobhan has been singing since she was very young. At 9 years of age she gave her first major solo performance in a “Riverdance” style show called “Shades of Green” which toured South Australia. She recorded her first CD “With Love From Siobhan” at the age of 10 as a gift for family and friends. When Siobhan was 12 she gave her first major solo performance at the Adelaide Festival Theatre, singing the beautiful “My Lagan Love”. Siobhan has been a winner of many local Eisteddfods and competitions since her first Eisteddfod in 2003. Over the last couple of years Siobhan has given 4 solo “Lunch Hour Recitals ” for Recitals Australia, and will be giving her 5th Recital in September 2010. Siobhan won the 2008 AMEB Grade 5 Singing Prize, and has been invited to sing at the 2009 AMEB “High Achievers’ Concert” after gaining a High Distinction (A+) for her Grade 6 Singing Exam. She also won the 2009 Adelaide Eisteddfod “Junior Vocal Championship”. Siobhan is studying Classical Voice at Adelaide University’s Elder Conservatorium. Siobhan was voted “Most Outstanding Emerging Artist” in the 2009 South Australian Folk Awards and was a finalist in the 2010 National Youth Awards. Siobhan was invited to sing at the 2008 Adelaide Fringe Festival with French singer/harpist Cecile Corbel and her band after they met on Myspace! Singing with Cecile inspired Siobhan to learn to play the harp. Siobhan now often accompanies her beautiful singing on harp – an ethereal blend! She presented her own Fringe Festival show in 2010. In spite of her short age, Siobhan owns three recordings, being “”Lilium” her last one. 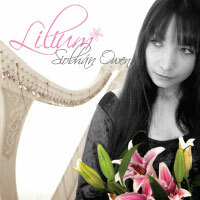 Lilium – the Lily – symbolises Purity, Beauty and Serenity, so is a fitting title for Siobhan’s third album which has been produced to showcase the purity and beauty of Siobhan’s voice and the serenity of her delicate harp playing. Siobhan, who celebrated her 17th Birthday part way through the recording process, started classical voice lessons at the age of 9 and took up the harp 2 years ago. Born in Wales with Welsh and Irish heritage, it’s no wonder Siobhan has inherited a love of music and embraced her Celtic background! Siobhan is a student at Adelaide University’s Elder Conservatorium of Music, studying Classical Voice. These beautiful acoustic songs have been recorded in an intimate concert style setting. The Celtic pieces were recorded at Chapel Lane Studio with Siobhan accompanying herself on her Celtic Harp. The Classical pieces were recorded at the University of Adelaide’s “Hartley Concert Room” with Malcolm Day on the Steinway Grand Piano. The bonus track on the CD is a jazz piece “It’s Only a Paper Moon” which was recorded at Chapel Lane Studio. I first heard this song from the playing of the renowned breton harpist Alan Stivell… definitely a haunting song….Fairy tales are commonplace, but have you heard of a fairy song? Well, Tha mi Sgìth is reportedly a fairy song! The other well known title, Buain na Rainich, means Cutting The Bracken. There are many variations of the story relating to this song, but one version says that the song was originally sung by a fairy who caught sight of a beautiful girl when he was cutting bracken. They fell in love, but alas there was no fairytale ending. When her family learned of the love, they stopped the girl from seeing the fairy and they locked her away. His song mourns the situation. The tune of this song is very old and it is often used as a lullaby. In Cape Breton though, it is often used as a Puirt à beul!